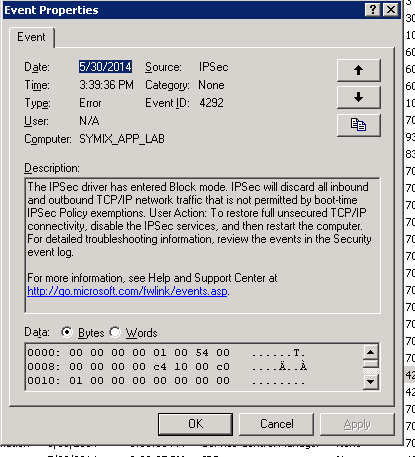 Resolving EventID: 4292 IPSec driver Block mode Error !! | Chinny Chukwudozie, Cloud Solutions. I recently encountered a situation with a Virtual Machine running Guest OS Windows Server 2003 SP2. The parent partition (Host) is running Hyper-v 2012 R2. I could login to the VM console using Hyper-v Manager, the Guest OS had an IP Address by DHCP, but there was no network access . I could not ping from or to the VM. Rebuild a new local policy store. To do this, Click Start, click Run, type regsvr32 polstore.dll, and then click OK. The above mentioned registry key did not exist in this case, so I only had to register the “polstore.dll” and that resolved the problem. This entry was posted in Hyper-v Manager, Microsoft Hyper-v, Network, Windows Server 2012 R2 and tagged Hyper-v Manager, IPSec, Network Adapter, Virtual Machine. Bookmark the permalink.